"A tabloid tale of the mafia kidnapping a movie studio. Karl Priam isn’t such a bad guy, but the Hollywood high life ruined his future as a director… until he survives an armed robbery. A solid performance for the news lands him another movie and it looks like a blockbuster. There’s a war behind the scenes. Head producer Bob Ruckin hates the Internet billionaire who bought the studio and he’ll do anything to bring it down: hire a wild-card, coke-headed director; a temperamental diva; an old washed up, heroin-addicted supporting actor; a train-wreck tabloid starlet; and the biggest action star of the last thirty years — who happens to be the public face of a mind-mastery self-help church. All the ingredients for the biggest flop in history. But when fast-talking Karl keeps this motley crew on track, Bob calls in the mob to bring the movie down. And all hell breaks loose. Mobsters don’t have time to wrangle with titanic egos and pampered beauties. They’ll kidnap or kill anyone to get their hands on the reclusive billionaire. Can Karl stay clean, dodge bullets, get his actors to fight back, and still make a movie?'" 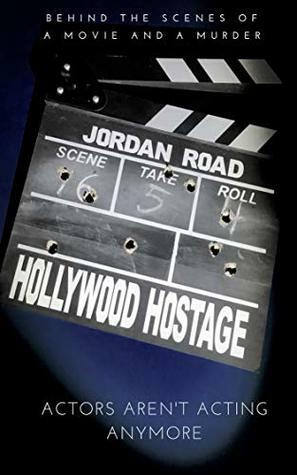 Hollywood Hostage is a high-energy action comedy novel that definitely stands out from what I normally read, but I'm glad I read it because I had a blast. Hollywood Hostage is set up a little differently from your normal action-comedy, and that is what I think I loved most about it. Rather than tell the story in your usual prose format, Road decided to switch things up a bit and incorporate some screenplay elements to the story. Instead of spending excessive time describing a new setting and placing the characters in prose form, Road begins each "scene" with screenplay-format directions and setup. When the author pitched this book, he explained that this was a bit of an experiment, and I have to say that I think it was a very successful one! I found myself really enjoying this because it did allow me to jump right into the action and dialogue of the story without being bogged down by a lot of extra detail that could have been provided in quick snippets. I also liked that this really incorporated a Hollywood movie style that matched the theme perfectly, which made the entire the entire book almost feel as though I were reading a movie within a movie. Most of the characters in this book are not overly likable--with a few exceptions--but I still found myself growing attached to a few, namely our main character Karl Priam and another character, Sarah. Karl is a bit of a mixed bag; he's not exactly good and has done a lot of questionable things, but he's oddly endearing because of his confidence in his abilities and his seemingly goodhearted nature that's hidden (deep) inside him. There were quite a few characters that had few to no redeeming qualities as people, but I still really enjoyed reading about them and the personality variety that they brought to the story. These characters all felt like such real 'Hollywood' types that add even more to the atmosphere. There are some rather cliche'd or trope-like elements throughout the book, but they were done in such an enthusiastic manner that twisted them into their own unique thing that I loved every second of it. It felt as though I were reading a book that was unabashedly using the basic skeleton points of a typical action comedy sort of movie--complete with some high action scenes, some sexual interest, and some scheming--but it was filled in with unique ideas and an engaging plot, as well as your occasional comical situations. The only real negative thing I have to say is that the ending seemed to drag on just a bit too much. Even then, however, it was still well-written and didn't lack in quality or interest--it simply could have been shorter. The rest of the book had pretty even fast-paced storytelling with a few scenes that seemed slower than others, but that all worked well together in the end.